The Georgia Ag Forecast was presented around the state this week at a series of meetings with producers. 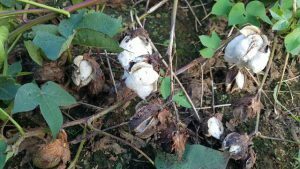 It shows that recovery from Hurricane Michael has been slow and that some producers are still harvesting cotton in January, which has never happened before. One cotton gin in southwest Georgia was expecting to handle 180,000 bales but will wind up ginning approximately 50,000 bales instead due to the losses from the storm this year. The forecast for next year’s crop production is clouded by uncertainty due to tariffs and rough market conditions. You can read more http://georgia.growingamerica.com/news/2019/01/georgia-ag-forecast-crop-outlook-clouded-storm-trade.